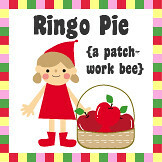 Pink Penguin: Zakka Along 2.0 :: Patchwork, Please kicked off!! 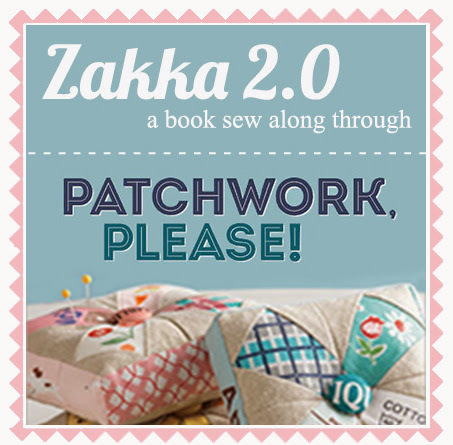 Zakka Along 2.0 :: Patchwork, Please kicked off!! I can't begin to tell you how much I have been looking forward to this! The Zakka Along finally kicked off with Penny's awesome variation of bellpepper coasters, the very first project in the zakka along!! I feel that it was just a few weeks ago when Lindsey kindly contacted me to bring up the idea of zakka along through my book, Patchwork, Please!. This, in fact, happened about a half year ago! You can imagine how thrilled I must have been, but I guess I was more nervous than excited at first. I wasn't sure if enough people will like the projects in the book enough to participate in it, and if my instructions are clear enough for everyone to follow through, and if anyone would be willing to be a contributor for my book's zakka-along. But knowing how fun and successful the first zakka along Lindsey hosted was, I had such a great feeling that this zakka along has a lot of potential for people to have lots of fun if I let Lindsey and Debbie take a lead in this event! Lindsey and Debbie are such amazing hosts! They have been working very hard behind the scene even before the book came out. I can't thank them enough for their willingness to do this and their absolutely awesome organizing skills!! I am sure you've already read the detail about the zakka along. Not sure what it is all about yet? Then you should check out here for details! It's not too late to join in! There are TONS of prizes from lots of great sponsors every singe week starting this week through the first week of October, not to mention great prizes waiting at the very end!!! Here is a schedule of the Zakka along! I have been a big fan of every one of these 19 creative people, so I was absolutely over the moon about them agreeing to be contributors! Thank you so much every one of you and all of you who are sewing along! There is nothing like seeing everyone's work made from my book really. It almost drives me nuts every time I see it! Once again, thank you to all of you who are sewing along through my book! My fingers are crossed that it will be so much fun for you!! It all looks lovely, I do hope all goes well with you. I look forward to seeing baby pictures soon! Fingers crossed! I have to tell you. I LOVE that you did not only used inches. I don't have to recalcute! Thank you! Best wishes for you and the little penguin. Your way sounds lovely - having parents to look after you is a great idea. Can't wait for my book to arrive so I can start. Happy news! Best wishes, Ayumi. I can't wait to hear more about your baby's arrival. Thank you so much for saying that, Teje! Oh how fun, Ayumi! Can you believe we're now on our way!!?? What a fun first week so far. Wishing you & your family the best, and check in as you can! I love your book, it's wonderful. I hope everything goes really well with the baby. How wonderful to stay with parents and be looked after. Aww what a sweet thing to say! Thank you! I hope you will enjoy the projects in it!! Thinking back to my own childbirth experience, I'd say you've made just the right decision. How I wish I'd had that support and time to rest and recover. Definitely take it easy and enjoy the pampering. Life often takes us away from our husbands, but it won't be forever. Very best wishes for a blessed birth. Oh I am glad to hear you think it is a great idea! I've been thinking I can do everything on my own, but so many friends of mine told me that I would be much more in need of help than I had expected in the first few weeks after the baby is born. Hopefully it is a good thing for my folks to spend some time with the baby too. 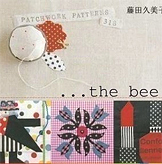 Your book is so full of beautiful patchwork projects and I do look forward to follow the zakka along. Thank you for sharing so much beauty and kindness, Ayumi. Wish you a happy stay with your family, and best wishes for a safe delivery. That sounds like a wonderful, japanese tradition. I've been thinking of you friend as your baby time draws near. Hope things go smoothly and I know you will appreciate the extra help being with your family. Love being part of this special hop. I've been so excited for your book and so happy for you and your success! It's so well deserved my friend. 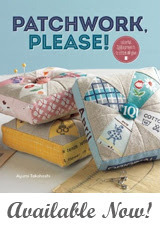 I just bought the book and will participate in sew along. Best wishes to you, Ayumi! Yay I am so happy you will be participating in the sew-along! Thank you Yeka! It is such an exciting time Ayumi. Enjoy your train trips; the peace and quiet and time with your parents. They must be so excited to welcome a grandchild into their home! All the best - we'll miss you but know that amazing things are happening in your life! Best of luck with your delivery! Best and warmest wishes for your delivery and meeting your new, special little beloved one for the first time! Oh wow! The time has just whizzed on by! What a lovely tradition. I spent a lot of time with my parents post delivery with my first. It was a lovely time for all of us. Congratulations! I have made the PP book blocks for a blanket band. I will post a photo when I finally get it all pieced together. Hugs! Aww thank you Roxie! You made my day!! I can't wait to see Kerry's Swedish Bloom quilt either! XO to you Ayumi. I hope you are well and happy with your new baby and home with Jeff now! I just saw this new book on Ellison Lane, it looks AMAZING - I can't wait to get my hands on a copy! Hi Ayumi I hope you and your new new baby are going well! I received my book in April and since the moment I saw it I fell in love with it! Congratulation your book is really gorgeous! Thank you! Hugs and love from Portugal! Congratulations! I kept checking back to see if your baby arrived--I'm so glad to see you all are well, and such a pretty baby! Don't feel like a bad blogger, you deserved and needed that time to yourselves:) All the best to you and your little family! I love your book! I am doing the Zakka along. It's been incredibly fun. Congrats on your baby.